Holy Basil [Ocimum tenuiflorum (also known as Ocimum sanctum)] has been shown to possess powerful adpatogenic properties and has been used to enhance the body's ability to respond to stress and minimize the negative effects of stress on the body. In addition, animal studies have demonstrated that Holy Basil can support carbohydrate metabolism and, as a result, healthy blood glucose levels already within the normal range. Holy Basil is revered as a sacred plant in Ayurveda, the traditional therapeutic system of India. 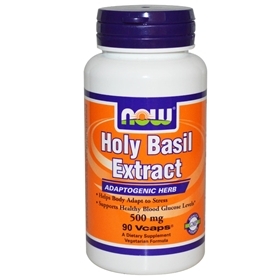 Holy basil is a powerful antioxidant with demonstrated antibacterial, anti-fungal and anti-inflammatory properties. Most studies with Holy Basil demonstate perhaps its greatest asset, its ability to relieve stress induce physical and mental relaxation. In today's hectic world, these findings may prove to be extremely significant for many. Stress becomes problematic when the demands placed upon us exceed our body's ability to cope, and especially when it becomes chronic. That leads to high levels of cortisol and corticosterone, damaging our nervous system. Untreated, this will eventually lead to anxiety or depression, and our immune system can be suppressed, eventually leading to sickness and even autoimmune diseases. In several studies, subjects were continually subjected to stress leading to elevated levels of stress hormones. After treatment with holy basil, the stress hormone levels were brought back to normal. Supplementation dramatically reduced their corticosterone levels, helping the subjects cope with stress, and elevating their mood and mental clarity.